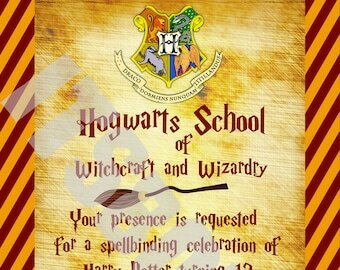 Custom Harry Potter Hogwarts Invitation (Gryffindor, Hufflepuff, Ravenclaw, Slytherin) Birthday, Wedding, Party etc. WOW! Quickest turnaround ever! File was exactly what I needed - great design, great work, just as described and just as I requested. THANK YOU!! My son is thrilled!! And so am I!